. إن الخدمات الممتازة وحسن الضيافة العالي في Daintree Eco Lodge & Spa Hotel تجعل إقامتك تجربة لا تنسى. لضمان راحة ضيوفه، يقدم الفندق الخدمات التالية: واي فاي في المناطق العامة, صف السيارات, خدمة الغرف, التوصيل من وإلى المطار, مطعم . لقد جهزت هذه الإقامة الفندقية بعناية فائقة لتوفر مستوى عالي من الراحة. في بعض الغرف يجد النزيل اتصال لاسلكي بشبكة الإنترنت (مجاني), حوض الاسترخاء, غرف لغير المدخنين, مكيف هواء, خدمة الإيقاظ. سواء كنت من محبي الرياضة أو كنت تتطلع لتفريغ عناء نهار صعب، ستجد خدمات ذات مستوى عالي بانتظارك كمثل حوض استحمام ساخن, حمام سباحة خارجي, غوص, صيد السمك, سبا. 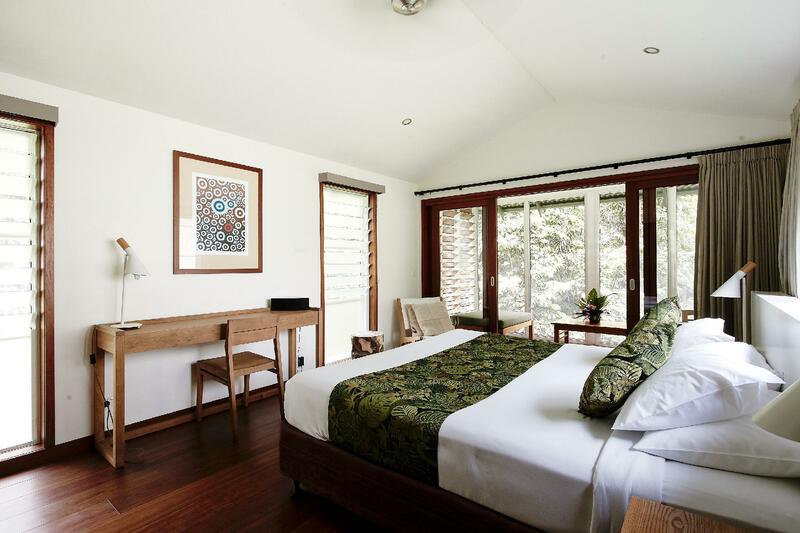 يشكل Daintree Eco Lodge & Spa Hotel بخدماته الراقية وموقعه الممتاز، قاعدة مثالية للاستمتاع بإقامتك في داينتري. The weather was very wet but the staff were nothing but sunshine. Lovely setting. Well situated. Unlike the resort we just left where the emphasis was on extracting as many dollars as they could, Ecolodge staff were out to ensure our stay was comfortable and enjoyable. They were all very friendly, professional and very obliging. Despite the weather we had a great stay. Would definitely recommend this accommodation. In room shower temperature not controllable, AC did not work. Pool not maintained, dirty. Overall property not maintained. Location beautiful and could be an exceptional lodge. Dining room service was slow and food quality was not consistent. My husband and I stayed at the Daintree Ecolodge while visiting Australia on our honeymoon. The property is so beautiful and you feel completely immersed in the rainforest. Every single staff member we met was incredibly friendly and helpful, getting to know us and how we were enjoying our stay. We booked a Canopy Bayan and it was beautiful - clean and cozy with great amenities and an awesome outdoor deck to enjoy the sounds of the rainforest. We enjoyed walking around the property and the trail to the waterfall. The chef at the Julaymba Restaurant is so talented - we ate there every night and had such a memorable experience trying new foods that were local to the area. We highly recommend staying at the Daintree Ecolodge and hope to stay here again ourselves in the future! Devine rainforest relaxation, delicious local hamper on arrival and breakfast was gorgeous. Waterfall and lagoon just stunning . Will return! Loved the yoga by the pool. We were lucky to have stayed when it was raining. The highlight for me was listening to the different animals at night, especially the call of the Cassowary. I really enjoyed our night here we chose the middle priced banyan after reading the cheapest was a little outdated. It was beautiful there were some ants on the wall but what can you expect in the rainforest. The food in the resteraunt was amazing it was expensive but definitely worth it as a one time treat. The spa treatment was heavenly but I thought the bathroom in the spa could do with a facelift. I would definitely recommend staying here but I’d go for at least the middle option of banyan if you want to get your moneys worth. Beautiful canopy room, loved the small touches - homemade biscutes, handcut soap, daintree tea. Enjoyed sleeping with the room opened up to the rainforest. Loved the restaurant and grounds, and had a nice spa treatment with lovely oils. Only small gripe was the pool amd spa area is dated. And the swimming hole was just a hole, in pretty settings and crisp clear water but something for a plunge in not a swim. The restaurant waiter in the evening was a supercilious and arrogant man the meal was terrible - frozen fish and tough duck ! In contrast, the young breakfast staff were lovely and Nat at reception was gracious, extremely helpful and her hospitality was excellent. We thought it was absolutely COOL to hear the sounds of the rainforest , to watch the butterflies and marvel at the flora... from the safety of our strongly screened patio! Thank you for existing! 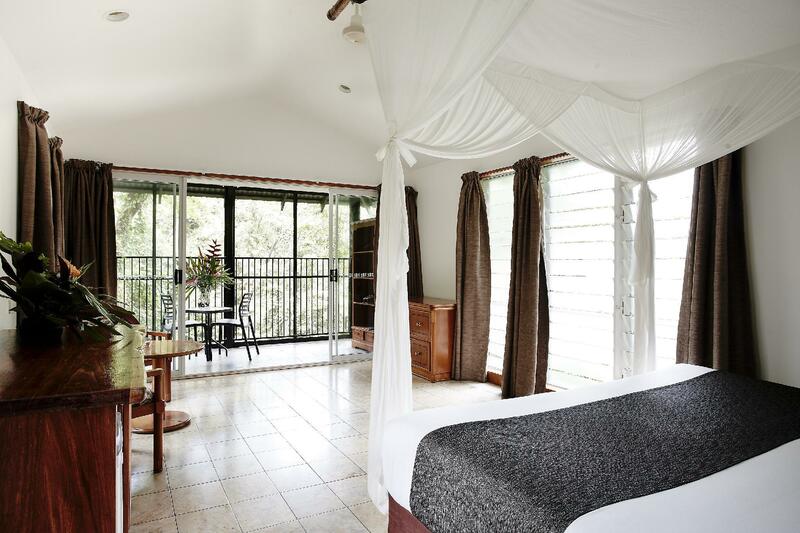 The canopy room was nicely renovated and had a great view into the rainforest. It was nice to hear the nature around you at night. The hotel itself could improve its amenities as the pool and lobby area were a bit dated. Overall the place is nice but a bit too expensive for what you are getting. We stayed 2 nights in a canopy room and if you're a nature lover, this is a must do. The room was a good size and very comfortable. There is no wifi or TV but why would you need these in a place like this where you have the rainforest all around you? Windows on all sides with flyscreens so you can have them open allowing the smells and sounds into the room. The terrace was equipped with flyscreens too so you can just have the doors open at all times. This for us was the best way to relax and unwind. The restaurant was stunning. The chef has put together a truly remarkable menu and delivered tasty dishes you would come to expect from a quality Melbourne restaurant. Being only a couple mins drive to the Daintree town, the location is good, but what is best about this its position is the forest. Take yourself for a walk around the grounds and up to the waterfall, just take your bug spray with you. The only downside was the treatments we got in the spa. They were not value for money. Was beautiful. Food was Devine, Adriano the maitre d was awesome. Most enjoyable experience close to nature! 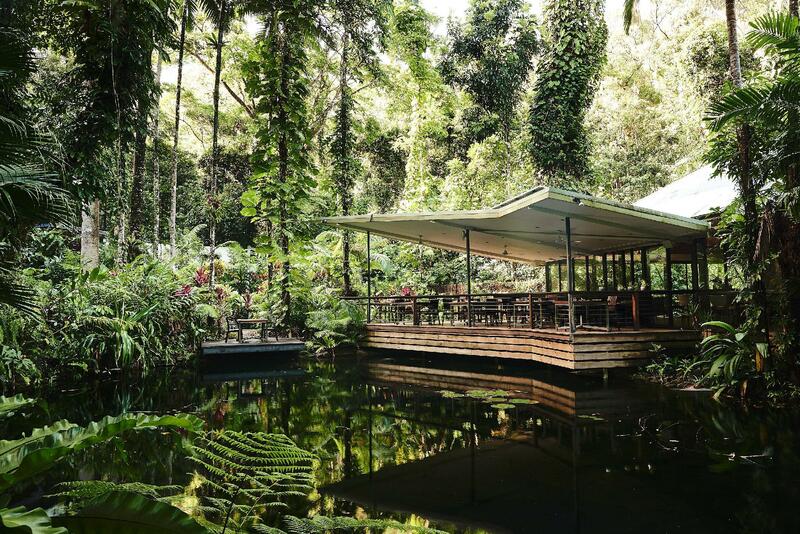 This venue is situated in an incredibly serene and one-of-a-kind location in the Daintree Rainforest. It is beyond picturesque. We stayed in a lovely and well appointed Canopy tree house with our teenage daughter. She appreciated the lodge and fine dining. But I would not waste your money on taking younger children to this place. In truth it is a couples retreat, and would be amazing for a romantic getaway. Sadly, the swimming hole was not full enough when we visited. So we had to make do with the pool which is ok, but not of a resort-standard. This place in the tropics, and it is HOT! the humidity is palpable and you will sigh with relief each time you step back into your air conditioned tree house. 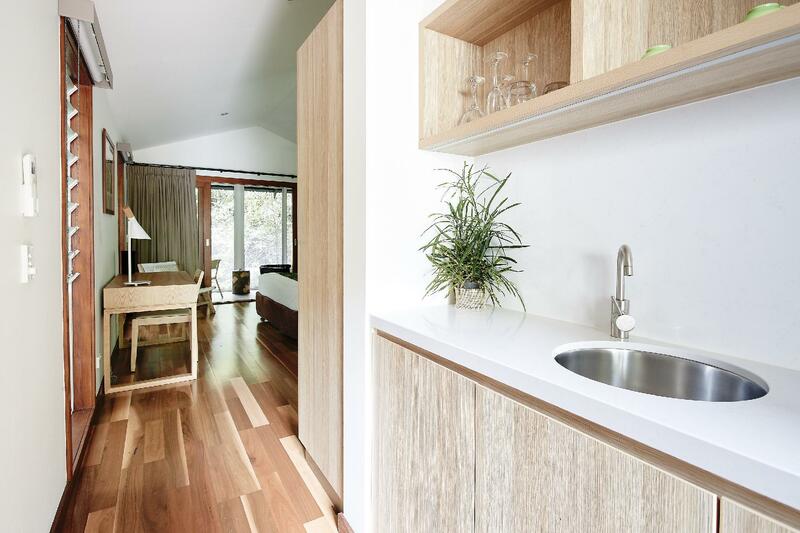 The bed was sublime, the balcony overlooking the trees was stunning and the bathroom clean and modern. However, the stand out was the food served in the dining room. The small menu is pricy but everything is extremely good. Breakfast is included and also very good.